For a different PS2 FPS controller get a Splitfish EdgeFX. A lost era of great game play is the Twin Stick mode. Concept of moving in one direction while at the same time shooting in another. A review of Arcade Twin Stick greats, followed by implementing the home versions to Twin Stick mode. Robotron by Eugene Jarvis was one of the first though Twinstick Space Dungeon was already out. Prior to presentation of the follow up to Defender Arcade, Jarvis injured his arm and had to come up with an alternate method of operating the fire button. A rushed Inspiration to be able to demo the game, the Twin Stick concept was born. Accidents provide the greatest ideas! The dual joystick design was developed by Eugene Jarvis, and resulted from two experiences in Jarvis's life: an automobile accident and playing Berzerk. Prior to beginning development, Jarvis injured his right hand in an accident—his hand was still in a cast when he returned to work, which prevented him from using a traditional joystick with a button. While in rehabilitation, he thought of Berzerk. 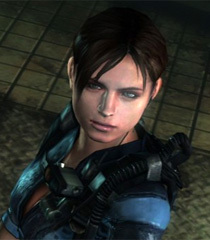 Though Jarvis enjoyed the game and similar titles, he was dissatisfied with the control scheme; Berzerk used a single joystick to move the on-screen character and a button to fire the weapon, which would shoot the same direction the character was facing. Jarvis noticed that if the button was held down, the character would remain stationary and the joystick could be used to fire in any direction. This method of play inspired Jarvis to add a second joystick dedicated to aiming the direction projectiles were shot. 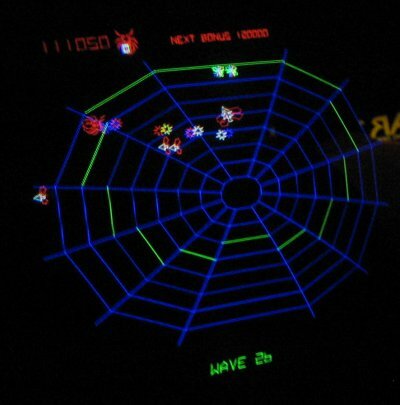 Jarvis and DeMar created a prototype using a Stargate arcade system board and two Atari 2600 controllers attached to a control panel. In retrospect, Jarvis considers the design a contradiction that blends "incredible freedom of movement" with ease of use. 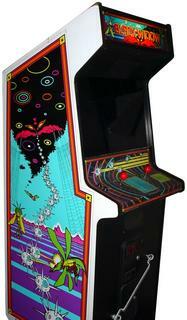 Robotron is an intense game in the lines of Defender. the difference is the real feeling of controlling every move and shot. Spent many many quarters on these Williams classics. Smash TV was a followup by Eugene. Each Stick controls a Tank Tread. Avoid missile while spinning and moving tank backwards. Climb up the skyscraper with two hands. LEFT-Up RIGHT-Down, LEFT-Down RIGHT-Up. Control that Mech! Rotate, Run, Duck, Jump, Strafe, all done with Twin Stick. A color vector Dual Stick game with along the lines of Robotron. Shoot the bugs, collect the money. More Robotron style gameplay, throw in an Exidy Venture aspect. Look for the Exit Room. Although four buttons was used in place of second stick, same type of gameplay. Okay, who stole the red ball off the stick? The biggest frustration in twin stick games is obtaining an expensive Twinstick and using it on just a few games. Hardly justifies the price unless you are a Twin Stick aficionado. There is a work around for a lot of Twin Stick Type games. The first Twin Stick "mod" is easy one, the ATARI 5200 with the dual stick coupler. Robotron and Space Dungeon Twin Stick with coupler adapter courtesy of Atari. Sadly Vanguard didn't go Twin Stick, second stick could've replaced those four buttons. ATARI 7800 also has Robotron dual stick mode, either a custom built coupler or solid base joysticks as the Wicos. The PS1 has a unique capability in the Arcade Williams and Midway Arcade Classics series; full custom controls of any player controller for any player. Player two controller can be customized to work with player one. Robotron Player 1 can control movement and Player two can fire. Now if two Arcade digital sticks are plugged in, the player two stick can be made as the directional fire buttons. See where I am leading? Single player now has Dual Stick control just like the original Arcade! When I first discovered this I was truly back in Twin Stick heaven! Notice there are no hardware mods, just configurations in the game menu. Fully customizable controllers and Arcade Dip Switches for lives and difficulty, Unlike the newer console Arcade Treasures compilation releases. DREAMCAST opened up a whole new set of possibilities with all the Homebrew and EMUs. Atari 400-800 Emu in particular proved interesting. It has 5200-400-800-600XL-130XE emulation. The Atari 400-800 computer emulation really shines by allowing custom controls to be entered. Just as the PS1 Arcade classics a dual mode possibility. Throw in a couple Arcade sticks plugged in player 1 and 2 ports and get ready for twin stick action! Again no hardware mods needed. This is one feature filled EMU. Disk management, cart change, virtual keyboard, complicated and powerful. ROBOTRON and CROSS FIRE. The PS2 also has the Midway Treasures series with Twin Stick readily available on the dual shock analog sticks. Not quite the same effect but a "small stick" start. As arcade compilations got released on the PS2, Gamecube and XBox, the duel stick games would become the direction pad for movement and four primary buttons for fire. SNES Smash TV one of the first to use this concept. PS2 uses both twin analog sticks and the direction pad-four button layout. The downfall of new Twin Stick games is that player two stick could no longer be implemented to player one duel stick hidden feature. Default Direction pad and primary four button layout also giving way to analog non customizable setups as in Dreamcast analog stick Virtua On and PS2 Vindicators analog control tank treads. One of the newest PS2 twinstick games Pop Cap's Heavy Metal utilizes the two analog sticks. The below Mod will will allow all these games to work as a true Arcade Twin Stick. These games are configured where the right stick is emulated by the controller primary four fire action buttons. A very simple mod that can be applied to any two player Arcade Stick setup. Original wires from 2nd player stick controls gets wired into 1st player primary PSX action fire buttons. A couple of toggle switches allows selecting the second stick as either two player mode or single player Twin Stick. Only Five connections on the PCB are needed for this mod. Four wires for the button direction and a fifth wire for the common ground return. A simple solder job to existing button solder pads. In Twin Stick mode Player one can use both the buttons and the primary/secondary sticks. This is as close as one can get without actually buying a ROBOTRON ARCADE. By including toggle switch bypass, original two player function is maintained as well. Ready to go on PS1 and PS2. With the above mentioned console adaptors, Gamecube, Dreamcast and XBox can also work with this arrangement. For any console Arcade controller that utilizes layout of direction pad and four primary fire buttons. Dreamcast Virtua On and PS2 Vindicators do not work since a duel analog stick is needed. However, the Wii and Gamecube Mayflash controller adapters convert the digital sticks to work as Analog sticks as well as the DPad and face buttons. This opens possibilities of discovering games that can be played in a twinstick method. You can also mount your arcade stick on its own table. I sometimes run a video game setup at the local Car Show. 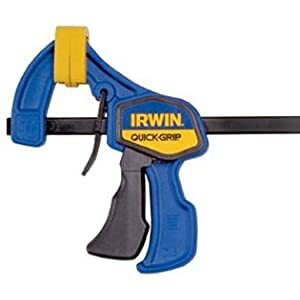 The Home Depot Ridgid stand and a couple of Irwin Quik Clamps fits the bill. Have care in clamping, the plastic under the BLAZE logo is very thin. Look at the white plastic under the toggle switches below, the fragile area. the appropriate adaptors times two for two player. A natural mapping between the Dreamcast and PSX controller buttons. The extra buttons on the Dual Shock, including the right Analog Pad, the L2, R2, L3 and R3 buttons, and the select button, are not used. I verified checking DC Street Fighter III Third Strike and DC Street Fighter Alpha 3 with a TOTAL CONTROL PLUS which has a slide switch for PSX Driving, PSX Dreamcast Controller Layout and a PSX Arcade Stick. The R1 and R2 buttons are active and the L1 and L2 buttons are dead when I set the switch to Arcade stick. The good news is when the switch is set to the Dreamcast Controller Layout, the R1 and L1 button works. I also tested my other two types adaptors, one is a regular TOTAL CONTROL which has no VMU port and the other made by INNOVATION which has a VMU port at the plug and works with Sega Saturn, PSX controllers and a PC PS/2 Keyboard. Both the regular Total Control and Innovation only has a driving wheel and regular controller option. The INNOVATION makes L1-R1 as one trigger and L2-R2 as the other trigger on a PSX controller. So it may not work on some Fighter gamepads that only have L1 and R1 buttons. The Total Control Plus is the one to get anyways for the three modes and a VMU Slot. I think the 9 Volt port is for the PSX Dual Shock Motor, never used it. 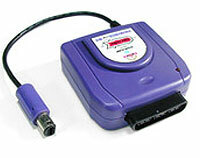 There is also the Mayflash PSX to Wii adaptor wich allows PSX controllers to work on any Wii Classic Controller game. Geometry Wars is the perfect game to try with the Twinstick mod, an updated Robotron now played with real Arcade sticks! For a real intense concentration try playing Defender Twinstick mode. Or try a different approach in Streetfighter, roll the secondary stick for combo punches. Blaze also built a Home Arcade System, furniture which can hold the Twin Shock. You get two complete controllers built into one slick unit. Each side has an arcade style joystick, eight buttons in a fighter layout, and a button for setting turbos, one for clearing turbos, and a slow feature. There are also two sets of Start and Select buttons located in the center of the unit. The Twin Shock Home Arcade unit is intended for use with the Home Arcade System, although four of the six rubber feet are on the outer edges of the bottom, too far to hold it fastened to the H.A.S. I did find that relocating the two rubber feet closest to the front on either side inwards far enough to rest on the H.A.S. controller surface provided ample traction with little fuss. However, for tournament sessions, I break out a pair of short bungee cords and strap that sucker in place! This is an excellent controller for fans of old school fighters. Designed to help you keep all of your gaming gear in one spot, the Home Arcade System is a modular furniture system with instructions which show you how to build an upright storage/gaming unit with an arcade case layout. The H.A.S. does not look like an arcade case. It has no sides to it and is considerably shorter than an actual arcade game case. Performance: However, the Home Arcade System does provide a place for a small television (or monitor) on top, a shelf that is perfect for mounting a flight stick, steering wheel, or arcade stick. Last edited by CRTGAMER on Fri Mar 02, 2018 12:27 am, edited 109 times in total. has anyone ever told you that you're one of the best thread-starters on this board? Thanks! Just like purty pictures. Last edited by CRTGAMER on Tue Nov 21, 2017 10:24 pm, edited 2 times in total. I remember the Cube version of Smash TV let you use the analog stick and the c-stick which was cool. noiseredux wrote: has anyone ever told you that you're one of the best thread-starters on this board? noiseredux wrote: I remember the Cube version of Smash TV let you use the analog stick and the c-stick which was cool. Twin Stick games such as Smash TV and Robotron are very intense. Look at FPS games for instance. You are always looking around the next corner on high alert, stopping while seeking cover a moment's respite. In Robotron there is no break until all the enemies are dead, 100% alert level must always be present. Once a level is complete breathe in, a quick color flash to the next enemies everywhere level. A lost era of very intense gaming with Twin Sticks waiting to be rediscovered. Here is an older game with probably the hardest dual action play. You have time to react which is a good thing because the keyboard is your Twin Stick. A reactionary task as in the Arcades Defender and Stargate multiple buttons. Four keys to move and another four keys to shoot. Was it W A S Z for movement and I J K M for fire? My first home system dual control Robotron fix on the Commodore Vic20. Later versions offered single joystick, not quite the same control. Note that this "both hands on eight keys game" can be emulated via Dreamcast with Vice Commodore and ATARI 800DC Emus. A menu driven custom control will enable the Arcade Twin Stick! Adding this game to the OP. Online game version, unfortunately not a Twin Stick keyboard mode. Move around the blocks for cover, while shooting in another direction. Keyboard very tricky! Last edited by CRTGAMER on Sat Aug 21, 2010 12:18 am, edited 2 times in total. CRTGAMER wrote: Unfortunately no analog conversion here either for the Dreamcast Virtua On or Vindicators for PS2. I have two of those, couldn't get them to work on the PS2. Unfortunately not Dual Shock compatible even on the older PS1. Does make a nice direction pad on either stick though. At one time was contemplating converting the spare Flight Stick wired up to a PSX Dual Shock PCB. The potentiometers would be a painful soldering experience. Blaze Twin Shock Mod though digital only, worked out for the better. Got the "Red Ball" controls as in the original 80s Twin Stick games. The beautiful Dreamcast Oratorio Tangram is where Activision really screwed up; on the Control Scheme. Why wasn't the direction pad and four primary buttons offered as an option? A sensible smart layout emulating natural position of Twin Stick via the pads. Exclusive Virtua On Twinstick expensive and hardly justifies for only this one game. Because PSX Flightstick is not Dual Analog compatible, the DC adaptors won't work. A tempting tricky mod soldering up DC potentometers and PCB to the old PSX Flightstick, quite an endeavor. He's apparently sold a ton of them via Yahoo Auctions Japan, but I'd kill to get the mod done on my stick with seperate Analog/Flightstick mode activated by flipping the existing Flightstick/Digital toggle switch so I can still use it on my PS1 flightstick games and my PS2/PS3 games where it seems like it would be awesome to use. He's apparently sold a ton of them via Yahoo Auctions Japan, but I'd kill to get the mod done on my stick with separate Analog/Flightstick mode activated by flipping the existing Flightstick/Digital toggle switch so I can still use it on my PS1 flightstick games and my PS2/PS3 games where it seems like it would be awesome to use. Nice! With that PSONE white plug looks to be a PSONE PCB bridged inside. I read somewhere not the best PCB to use for soldering, but looked like it works fine. My bet is the original analogs of the Flightstick are still used, soldered to removed PSONE analog pads. Digital buttons all jumpered into the appropriate button pads on the replacement PCB. To switch between the original and replacement PCB would be a treat! It could be possible. I modded a Zaxxon Arcade controller to work on three different systems. Might write another guide for the Zaxxon Mod at a later date. Who knows, might take up your inspiration on my spare Flightstick. ZAXXON Arcade Controller Mod Guide is done! Last edited by CRTGAMER on Thu Aug 05, 2010 1:29 am, edited 2 times in total.